I got this great idea from Pinterest and was looking forward to trying it out and this week fifth graders helped me do just that. 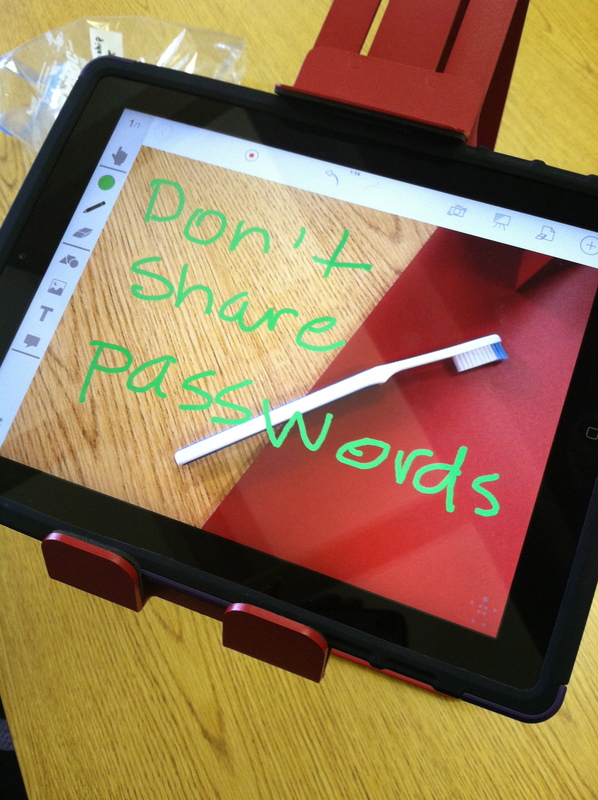 This simple idea is from a blog called comfortably20.blogspot.com and it uses real life props to reinforce some of the basic tenets of digital citizenship. I’ve found that lecturing about this isn’t as effective as I’d like it to be and so this time students took over and ran their own lesson. 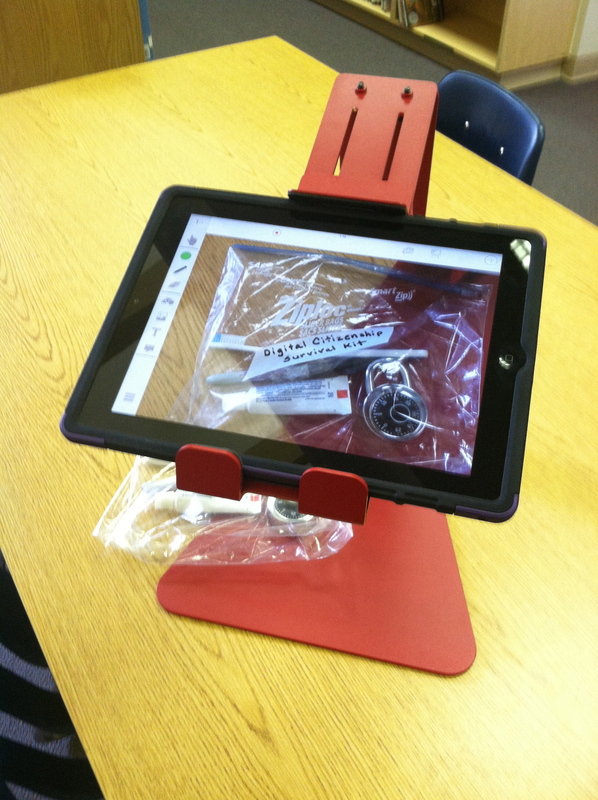 With the help of my iPad, a wonderful new accessory called a Justand to turn it into a document camera, and a fantastic app called Stage, students took each item out of the Digital Citizenship Survival Kit and they discussed as a group what the item symbolized. They annotated on the screen when they were happy with a consensus. The items are a padlock (for strong passwords and keeping personal info locked up), a tube of toothpaste (for keeping it “clean” in regards to language and also to demonstrate that what you put on the internet is “out there” and impossible to get back, like trying to put toothpaste back into the tube), a permanent marker (for the fact that everything you put online is permanent even if you hit the delete button), and the toothbrush (for not sharing passwords just like you wouldn’t share your toothbrush). Students loved using the iPad as a presentation tool and this was a great way to introduce them to that skill and the type of app they could use to demonstrate their learning. Kindergarten–We read one of our favorite Halloween books, Room On the Broom by Julia Donaldson. Great story, great rhymes, great vocabulary to figure out, and wonderful illustrations. We used our story re-telling rope at the end to retell the story, too. First Grade–First graders enjoyed the book app The Witch Has An Itch by Donna Guthrie. This is a simple app–no interactive features–but they liked the story of a witch who became allergic to doing bad spells, and really enjoyed the reading by the author. Second Grade–Lula’s Brew by Elizabeth O. Dulemba, is another book app that does not have interactive features but has wonderful illustrations that looked amazing on the big screen TV. Second graders loved the rhyming story and the idea of a little witch who wanted to do things her own way–a good way. Third Grade–One of my favorite Halloween read-alouds is Chris Van Allsburg’s The Widow’s Broom. The moody, atmospheric illustrations are the perfect counterpart to the wonderful, weird story of a witch’s broom that comes to life and the widow who saves it from her close-minded neighbors. We compared it to an ebook which would have most likely had interactive features and realized that with a drawing, albeit an amazingly clever one, our minds can do exactly what technology can do and sometimes better! Fourth Grade–Using a Visible Thinking Routine called See, Think, Wonder, fourth graders looked at and discussed an illustration from Esteban and the Ghost by Sibyl Hancock and then heard the story. The enjoyed trying to figure out what the illustration meant and then finding it later in the story and comparing their ideas with those of the story. Sixth Grade–no library this week due to the Fall Festival.